The Anti-Villain League decides it needs an insider's help and recruits Gru in the investigation. 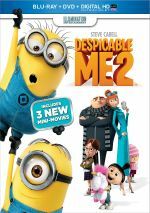 Two years after Minions took the franchise to new commercial heights, the series returns with 2017’s Despicable Me 3. This time we meet Balthazar Bratt (voiced by Trey Parker), a former child star turned super-villain. Bratt stages a heist that former baddie turned hero Gru (Steve Carell) fails to foil. This leads to the loss of Gru’s job at the Anti-Villain League. While Gru deals with this unemployed new reality, he learns of a twin brother named Dru (Carell). 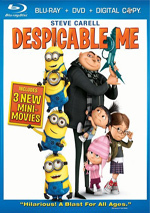 Gru takes his new wife Lucy (Kristen Wiig) and adopted kids Margo (Miranda Cosgrove), Edith (Dana Gaier) and Agnes (Nev Scharrel) to the country of Freedonia to meet Dru and get to know him, all while he battles his competing good and evil urges. Me 3 suffers badly from "Sequel Syndrome". Each new movie needs to add characters to keep things fresh, but each new movie also must service the existing characters in a reasonable manner as well. In Me 3, this leads to a slew of barely-related storylines that get crammed together so all the established characters get their screen time, and it makes the end result a mess. The competing plot points don't connect well and they mean the film feels confused and overstuffed. Seriously, how many story elements can one short movie contain? We have the Gru/Dru relationship, Gru/Lucy's desire to get their jobs back, Lucy's attempts to be a mother, Bratt's evil antics, Agnes's quest for a unicorn, Margo's "romance" with a local, Minion Mel's rebellion and probably other bits I forget. It's way too much, and all these competing threads give us a bloated movie. There’s no way a 90-minute film can pack in enough development for the mix of elements, so most end up underserved. Me 3 feels like the filmmakers are running on fumes. The movie's just such a mess, and the quality of the comedy and action can’t overcome the flaws. The villain feels weak and shoehorned into the mix. Bratt reminds me too much of the first movie's Vector - they're not clones but they give me a similar vibe, and Bratt never manages to develop into his own character. He's just an excuse for lots of cheap 80s gags. Dru also feels like a gimmick - "Gru has a brother!" He exists to reflect Gru's journey and doesn't stand on his own well, so like Bratt, he gives the movie a way to explore easy jokes but he doesn't do anything notable on his own. All of this adds up to an uninspired animated tale. Too scattered and without aim, Despicable Me 3 becomes the least compelling entry in the franchise. 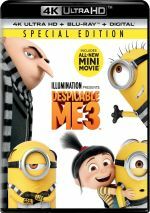 Despicable Me 3 appears in an aspect ratio of approximately 2.40:1 on this Blu-ray Disc. This became a pleasing presentation. Sharpness always looked good, as the movie exhibited fine delineation. No obvious signs of softness marred the image, and I noticed no jaggies or shimmering. Edge haloes and print flaws also remained absent. Colors seemed solid, as the movie offered broad palette. The hues delivered lively, full hues with good reproduction. Blacks appeared dark and dense, while low-light shots came across as smooth and clear. The image worked well. Downcoverted to DTS-GD MA 7.1, the film’s DTS-X soundtrack suited the material, with a soundscape that came to life during the movie’s occasional action scenes. Those offered planes, explosions and other dynamic elements that popped up in logical spots and blended well. Quieter scenes also fared nicely, as they showed good stereo music. Effects created a fine sense of place and delivered a rich sense of surroundings. Audio quality satisfied, with natural, concise speech that lacked edginess or other issues. Music came across as full and warm, while effects delivered rich, accurate material. Me 3 boasted a fairly solid soundtrack. As we shift to extras, we start with a mini-movie. The Secret Life of Kyle runs four minutes, 13 seconds and focuses on Gru’s mutant dog-like creature. It offers a moderate diversion. Including an intro from actor Dana Gaier, one deleted scene lasts 40 seconds. It shows Gru’s kids as they get to know Freedonia. The scene doesn’t add much. Under Minion Moments, we see two clips: “Drenched” (0:40) and “Overkill” (0:38). These provide quick bouts of physical comedy that seem mildly entertaining at best. Next comes Character Profiles, a domain that offers five actor-based featurettes. We find “Steve Carell (2:12), “Kristen Wiig” (1:48), “Miranda Cosgrove” (1:57), “Dana Gaier” (2:20) and “Nev Sharrel” (2:06). In these, the actors discuss their characters and performances. They tell us little of substance. The Making of Despicable Me 3 takes up six minutes, 50 seconds and features Illumination founder/CEO Chris Meledandri, director Kyle Balda, writers Ken Daurio and Cinco Paul, editor Claire Dodgson. “Making” discusses challenges presented by the third film, the work of the co-directors, editing, cast, characters and performances. It’s too short to offer much substance, but it gives us a decent array of insights. During the four-minute, 13-second Developing Dru, we hear from Meledandri, Balda, Paul, Daurio, Carell, and animation directors Bruno Dequier and Julien Soret. As expected, we learn about the design/execution of Gru’s brother in this brief but tight overview. Next comes The AVL Files, an interactive feature. It allows us to select any of six characters from the three movies and learn a little about them. It seems cute but not especially valuable. After this comes the Freedonia Visitors Guide, an interactive map. It lets us choose from five locations and see promotional clips about them. Though nothing exciting, it offers some amusement. Three segments appear within Despicable Me TV: “Balthazar Bratt Action Figure” (0:54), “Bad Boy Bod By Balthazar Bratt” (0:56) and “Agnes’ Super Cute, Incredible Amazing Toy Sale” (1:18). Each one uses movie clips along with narration to create advertisements. None of them seem especially useful. Called “Doo-Wit”, a Sing-Along lasts one minute, 36 second. It pairs movie clips with the aforementioned song to create a forgettable little clip. We also get a Music Video for “Yellow Light”. Here Pharrell Williams struts around town with 8-bit representations of the minions in tow. It’s a fairly creative piece. Two still galleries finish the set. Minion Mug Shots presents 10 images, while Wanted Posters offers eight frames. Both are cute. The disc opens with ads for the “Minion Mayhem” theme park attraction, the 2018 Winter Olympics, Nut Job 2, All I Want for Christmas Is You, Pitch Perfect 3 and the Trolls TV series. No trailer for Me 3 appears. A second disc provides a DVD copy of Me 3. It includes the same extras as the Blu-ray. 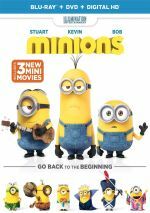 Well into the franchise’s existence, Despicable Me 3 shows a series that lacks creative energy. While the movie brings us a few laughs, it packs in too many story elements and never coalesces into a coherent, consistently enjoyable effort. The Blu-ray delivers very good picture and audio along with mostly superficial supplements. Me 3 offers firmly mediocre entertainment.